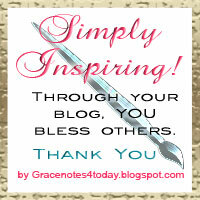 Grace Notes for Today: A New Award ~ Simply Inspiring! A New Award ~ Simply Inspiring! Announcing the first recipient of the new award, Simply Inspiring! I've heard it said that behind every dark cloud there is a silver lining. The bloggers I want to acknowledge with this award are people who are not shy to demonstrate their faith through their crafts. It is evident in their creativeness and by their very inspiring works of art, also known as cards. I totally believe that our Creator has blessed such individuals with an extra dose of artistry. Oh, you may not think you are an artist but I have come to recognize the hand of God in people's lives. I see how He works and uses everyday things to bless us. 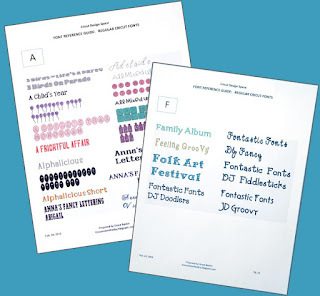 These creative people are able to take crafting elements -- simple items like glue, cardstock, ribbon and sparkles, and fashion a lovely card that speaks words of kindness, hope, joy, peace and love. They may find inspiration for their work in scripture verses and carry that vision through to the completed card. And since every good and perfect thing comes from above, through this award I am letting them know that their efforts have not gone unnoticed. Thank you for sharing your heart and God's love through your beautiful cards. Congratulations, Tammy! Thanks for all you do. Spend some time browsing through some of Tammy's cards and you will see why she is deserving of this award. If you or someone you know qualify for the Simply Inspiring! Award by meeting the criteria described HERE, please let me know. This is just one small way of recognizing special people who bless us with their creative designs.